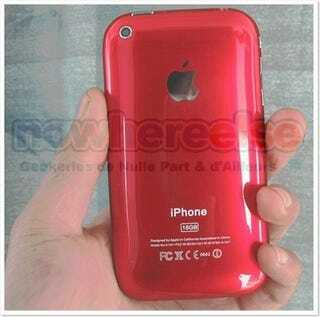 French site Nowhereelse has their hands on some photos that look suspiciously like a (RED) version of the 16GB iPhone 3G. However, it's lacking the telltale (RED) badge, making this pic dubious at best. Update. Also, it could be the way the pic was taken, but the red color just doesn't seem right. Or maybe I'm starting to go color blind. Either way, it could be a case or a legit (RED) iPhone 3G. Or maybe it's just a nice, glossy paint job by someone who wishes there were a (RED) 3G out there in the wild. Regardless, this kind of simple announcement is one we could easily expect to see Apple making at MacWorld this week. Here we go. The last Apple Macworld keynote ever.